Smart Bathroom Scales Explained - Which? Is it worth investing in one of the new generation of smart bathroom scales? We weigh up the pros and cons. Smart bathroom scales can connect to your smartphone or tablet, enabling you to view, store and track your vital statistics through an app. Different scales offer varying degrees of smart functionality, but almost all transfer your weight and other body measurements to an app when connected to your device using Bluetooth and/or wi-fi. So, if you're keen to be able to quickly track your progress across a range of readings in this way, it may well be worth investing in smart bathroom scales. Don't miss our full bathroom scales reviews, where we reveal the best and most accurate models. As well as measuring your weight, most smart scales give a wide range of body composition readings, such as body-fat percentage, body-water percentage and muscle mass. These scales use a method called Bioelectrical Impedance Analysis (BIA) to do this, which involves sending a small electric current around your body - so it's recommended that you don't use one if you have a pacemaker or other internal medical devices, or if you're pregnant. Body fat percentage The proportion of your body fat to your overall weight. Body water percentage The total amount of water in the body expressed as a percentage of your total body weight. BMI Some body-fat scales give you a BMI reading, based on the height you enter and your weight. Muscle mass The percentage of your body's composition that's made up of muscle. Visceral fat This is also known as 'abdominal fat'. A higher amount of visceral fat is linked with an increased risk of several health conditions, such as type 2 diabetes, Alzheimer's disease and heart disease. How different apps show you this information varies between the different brands, but common functionality includes graphs showing how your measurements and weight has changed over time. Some apps can also feed your measurements into other health tracking apps, if you wish, so that you can see all the health data you're interested in, in one place. How much are smart bathroom scales? Smart scales are often pricier than scales that don't have this functionality - the models we've tested cost from about £40 to £150. The non-smart digital bathroom scales we've tested cost from around £15 up to £135 - but all apart from one cost less than £50. Across all bathroom scales tests, we've found that there's no direct link between price and quality, so it's well worth checking our best bathroom scales recommendations before buying to make sure you don't splash out more than you need to. Consider how you'd prefer to interact with your smart scales. Some smart bathroom scales can only be set up using the app, and others only show certain measurements through the app and won't show them on the display on the scales themselves. We've tested bathroom scales that cost as much as £150 but found no direct link between price and quality. If you're happy to always have your smartphone or tablet to hand when you step on the scales, this shouldn't be too much of a problem. But if you want the freedom for you - or other members of your household - to be able to use your scales without opening an app, you'll need to buy one of the models that enable you to do this. Our bathroom scales reviews can guide you to the models that require the most and least use of an app to get to your measurements. Which smart bathroom scales work with iOS and Android? As with all smart devices, not all smart scales are compatible with all operating systems. For example, some work with Apple's iOS but not with Android - so you'll need to check operating system requirements before buying. Also consider which - if any - other smart health gadgets (such as an activity tracker) or apps you already use to track your health, and if you'd appreciate the ability to sync your bathroom scales data with these. We've tested six sets of smart bathroom scales. Find out more about these models and get access to our full test lab reviews. These scales offers lots of different measurements, including weight, body fat percentage, body water percentage, muscle mass, bone mass, BMI and BMR. 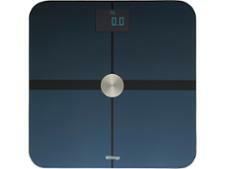 You connect these scales to an app on your smartphone or tablet via Bluetooth, where all measurements can be recorded to help you easily keep up to date. Read our full Beurer BF 700 Bluetooth Diagnostic Scale review. Another set of scales from Beurer that you can connect to an app on your smartphone or tablet via Bluetooth. All measurements are automatically uploaded to the app so long as it's connected to the scales to help you stay on track. It gives readings for body fat percentage, body water percentage, BMI, muscle mass and bone mass. 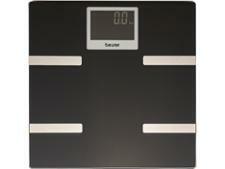 Plus, these scales can automatically recognise up to eight different users for fast body measurements. Read our full Beurer BF 800 Bluetooth Diagnostic Scale review. These scales promise to give weight measurements accurate to the closest 50g. You can create up to four user profiles, with information such as height and gender, for quick and easy body composition measurements. The scale is also designed to automatically recognise users as soon as they step on, saving you the step of manually selecting your profile each time. You can connect these scales via Bluetooth to an app on your smartphone or tablet, which automatically records your measurements to let you see how much you've progressed. Read our full Tanita RD-901 Body Composition Monitor review. 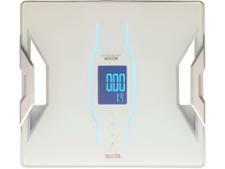 This scale can automatically recognise up to eight different users for fast body measurements. And as well measuring your body fat percentage, this scale gives a reading for your BMI and even your heart rate. You'll have to connect this scale via either Bluetooth or wi-fi to an app on your smartphone to set it up for the first time. All body measurements are automatically calculated and stored when the scales are connected to the app, to allow you to monitor your progress. Read our full Withings WS-50 Smart Body Analyzer review.